Anyway, Market Basket had these bags at 2 for $5 about 6-7 weeks ago and I have been badly hooked every since (probably because they are still on sale!). I'm a sucker for dark chocolate and I've gone through at least a half dozen bags of the ones dipped in hershey's special dark chocolate. Mmmmmmm, man these are so good! Take it from a man who has eaten way too many pretzels, the dark chocolate ones are fantastic. On Second Scoop Bite: Well, first I should say that I wasn't comparing Snyders nutrition to Rold Gold's nutrition 1:1, I didn't expect the big difference between dark and milk chocolate. I have corrected this error. Anyway, I needed a chocolate fix this morning so I broke open the bag of Hershey's milk chocolate dips and i don't like them nearly as much as the others. They taste just like a Hershey's kiss and unfortunately long ago I learned to hate Hershey's kisses. There's just something unpleasant about that chocolate and these taste just like it. I will honestly admit that once I shoved in a half dozen I did start to lose the urge to stop, but to me there is no comparison. special dark all the way!! 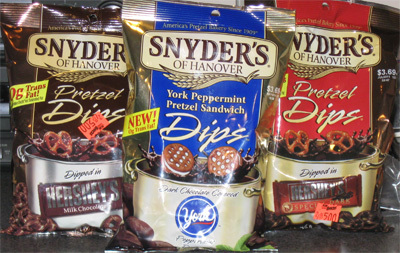 oh man I love Snyders pretzels too! I've seen these in the store and wanted to get them but was trying to eat up other things first. I'm so going to pick some of these up though soon.